So, I know its summer and all and making a pumpkin anything is a bit taboo, but hell, sometimes we want it, don't we? I'm 6 months pregnant, and even though I'm fighting a chest infection and have no appetite, I wanted to make these babies. You'll want to make them, too. Now, first a note. I'm in Ireland and I know some of my reader's won't have access to canned pumpkin. I simply roast up a butternut squash. Same taste-- some would argue its even nicer than pumpkin. Most canned pumpkin, you'll be interested to know, is actually squash anyways. Simply cut your squash in half, and cut each half in half (that's four pieces)-- scoop out the seeds and place flesh down in a pan. Fill that pan with 1/2 inch of water. Put it in your oven, HOT. I'm talking 400F/200C or so. Cook for 30-45 minutes (until the skin starts to brown and pucker a bit). Then you scoop out the innards, voila, you have your pumpkin/squash. You'll want 1/2 cup of that so you'll have lots left over for a nice bowl of soup or some muffins. Heat milk and butter in a saucepan until the butter has melted, remove from heat. Mix pumpkin/squash, salt and sugar. Slowly add flours to your mixture to form a dough. Leave this to rise in a greased bowl in a warm place for about an hour. Roll dough into a rectangle however thick you like, mine ends up a little less than 2 ft long by 12 inches. Take your butter and margarine (I'll be honest, I don't measure this out I just take a small handful of each, but the estimate is probably close. You can't really have too much. Margarine will help keep the filling gooey as butter will be somewhat absorbed into the dough as it cooks) and smears it all over the dough. I use my hands. Get messy. Then I use the butter/margarine on my hands to grease my pan. Combine sugar and cinnamon and sprinkle all over the dough. Now roll the dough up longways to make more rolls (if that makes sense). I use a piece of string to cut the rolls so they don't smush down, but of course you can use a knife-- about 1 inch thick. Place them in your greased pan and allow to rise for 30 minutes. You'll get maybe a bit more than 12 rolls. Bake at 350F/180C for 20 minutes. dash of lemon juice, optional but helps lift that tang! Mix butter, vanilla and cream cheese... and lemon juice if you want. Slowly add in powdered/icing sugar, add more if you want a thicker icing. This will be glaze like. 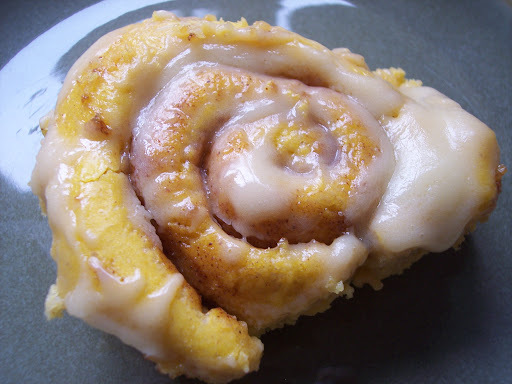 Smear all over the hot, delicious pumpkin cinnamon rolls.